For financial success there are certain things you must learn to do. These money skills, or financial practices, can make the difference in success or failure with money. Fortunately, they are mostly quite easy to learn even though often neglected. Each of the following articles shares a specific skill that can help you do better with your personal finances. Take time to learn each of them—one at a time, over time—until you master them all. Some skills are essential. Learning to consistently enter deposits and payments into our checkbook is one of them. Here are some thoughts about how to do it right. Balancing your checkbook seems to be an under-appreciated, scary, or frustrating thought to many, but it is essential to do it. Fortunately it is not really hard if you follow the correct procedure and develop a habit of doing it at least monthly. You can learn how to do it here. As often as not, when we make bad financial decisions it is at least partially the result of faulty assumptions. Since this is not intentional, it is important to learn how to avoid doing it. Follow these guidelines and you will make significantly better decisions about your money. Everyone is aware of identity theft these days. If it hits you the consequences can take a long time to straighten out and can cost quite a lot of frustration if not money. Fortunately, there are some good steps we can take to avoid being a victim of this common crime. Getting out of debt is one of the basic focuses of this web site. This brief article outlines the basic steps needed for you to succeed in reaching this important goal. Good financial decisions are only possible when they can be based on good information. Searching the web has become one of the best means of gathering this information. This article explains how you can find information you can depend on. One of the best decisions I made in high school was to take a typing class. It paid off big time. In a similar way, learning to use the ten key correctly has saved me immense amounts of time over the years. Here are a few tips about learning this simple skill. There are many ways to go about making decisions, financial or otherwise. Here is one simple way to guarantee good ones in many situations. It may be just what you need to help you make better financial choices. Learning some skills is more important than learning others. This one is near the top of the list. Money consciousness is not, as some suppose, making money itself a priority. It is being aware of how all decisions or choices affect us financially. Here’s how to make this technique work for you. Everyone knows they need to be organized in their work, especially with their money, to avoid problems down the road but sometimes we just neglect getting around to it. Here are some suggestions to get started. Make this an action step for today; it will pay big dividends. Here is a skill that is almost forgotten in today’s society, counting change. People assume, wrongly, that it is unnecessary. Not only will you save money by doing it, you establish a mind set that has broader implications. Paying for your car when you buy it is a pipe dream in many people’s minds but with this technique you can do it. Check it out. We set our goals with enthusiasm but sometimes they never seem to get off the ground. This article deals with two simple skills that can help us get into action and keep on trucking. A monthly planning session is a key to making good progress with your money. Here is a simple idea that can help make your planning time more effective. Probably a lot more effective. Making money depends on having the skills to be able to earn money. Here is one thing anyone can do immediately to get themselves moving in the right direction. Affirmations can be a great tool in helping us change our thinking and consequently our lives. Writing good affirmations requires following certain guidelines if they are to be effective. This article explains how you can write affirmations that work. One of the most important things required by those who want to be successful with money is the ability to avoid being overwhelmed by the onslaught on marketing around them. Here is the first skill to learn. Sadly, a lot of the marketing we see is flat out dishonest. Learning how to skillfully recognize false advertising is a crucial skill. An incredible amount of marketing for even reasonably valuable products is deceptive. Learning how to recognize this practice will help us avoid a lot of trouble and improve our buying skills. Sometimes we spend our money to buy things we don’t even need, but think we do because we think we need it at the time. Skillful marketers know how to create needs that don’t even exist! We need a corresponding skill that enables us to avoid such purchases. 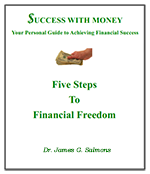 Learn these money skills to speed up your success with money! They are simple financial practices but they can make a big impact on your life.